Crispy chicken fingers smothered with a CopyKat Wingers sweet and spicy sauce! These tasty fingers are delicious by themselves, served as a topping on a salad or as a tortilla wrap. Last week for dinner we had these crazy good Wingers Sticky Fingers pictured above. I found this recipe a couple weeks back at Life as a Lofthouse. I knew as soon as I saw this recipe that it was defiantly something I needed to make. My first thought of this recipe was that this could be "dinner made two ways"
Anyone who has a picky eater knows exactly what I'm taking about. My son Carson probably wouldn't be too crazy about the sauce, but I'm pretty sure everyone else would love it. No problem I could just pull his chicken strips out before I cover them in the sticky finger sauce. This way I could please everyone. What I love most about this recipe is just how versatile it is. Not only can I please my picky eater, but I can change it up a bit as well. You can eat them plain or dip them into ranch dressing. Enjoy them topped on a salad or add them to a warm flour tortilla to make a Sticky Fingers Wrap. It's all up to you. This recipe for the sticky finger sauce is slap you silly easy. It only consists of 4 ingredients, chicken, Franks Original Hot Sauce, brown sugar and water. That's it! Now make sure to use Franks Original Red Hot because I'm hearing from everyone that's the only one to use. I toned down the amount of hot sauce by 2 tablespoons just to make sure it wasn't too spicy for my daughter. Really it wasn't spicy at all so next time I will add the full 6 tablespoons called for. Now I don't have a "Wingers" anywhere near by, so I really can't compare these to the original, but I have to say they were fabulous. We loved the sticky fingers both ways. This recipe is a KEEPER! I have included a few step by step photos, but the full recipe is at the end of this post. Bake the chicken strips according to package directions. 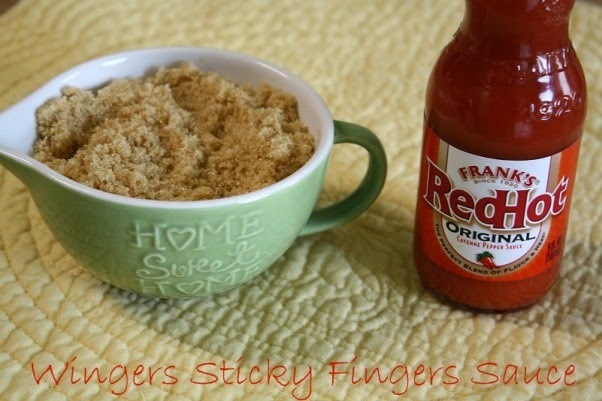 Add the brown sugar, franks hot sauce and water to a medium sauce pan. Cook the sauce over medium heat until heated through and the sugar is dissolved. Add the cooked chicken strips to a bowl that has a cover. 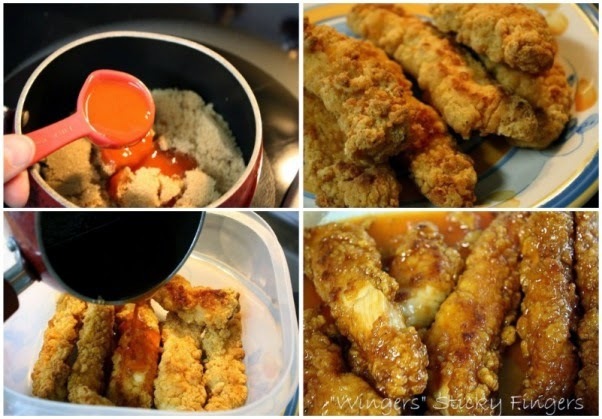 Pour that yummy sauce all over the chicken strips and seal the bowl shut. Shake the bowl until all the chicken strips are covered with the sauce. 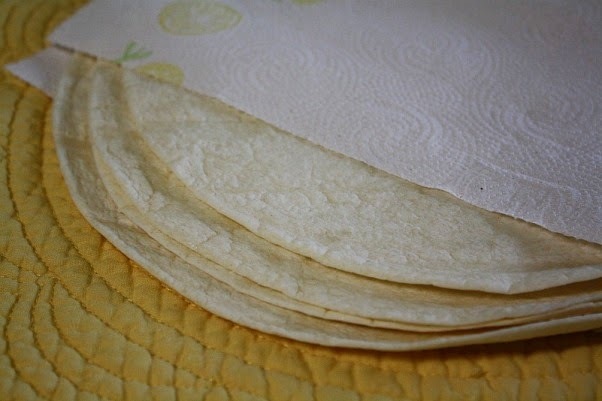 To make Sticky Fingers Wraps add the desired amount of sticky fingers to a warmed flour tortilla. Add lettuce, tomatoes and shredded cheese. Sticky fingers are also wonderful all on their own. I usually serve mine with macaroni and cheese and a fruit salad. Bake the chicken strips according to package directions. While the chicken strips are baking prepare the sauce. In a medium saucepan heat the hot sauce, brown sugar and water over medium heat until sugar is dissolved and sauce is heated thoroughly. About 5-10 minutes. Remove sauce from heat and set aside until the chicken strips are ready. Place cooked chicken strips in a large plastic container. Pour the sauce all over the and shut with the lid. Shake until all the chicken strips are coated with the sauce. To make Sticky Fingers Wraps, place two sauce-coated chicken strips onto the tortilla. Add desired amount of cheese, lettuce and tomatoes. Wrap up and serve. This recipe looks so good, cant wait to try it! I linked up my Taco Pie, we are having it for dinner tonight. According to my family this is the best thing I make! Thanks for the opportunity to share it Tina. Love this recipe! Of course, I love a lot of her recipes..LOL. Another great one to share Tina. Have a wonderful Sunday! Sweet and spicy chicken? I'm all over it. I linked up my Swiss steak recipe. Have a great Sunday. I love Holly! She has amazing recipes. I bought the Hot Sauce to make these and I plan on doing it this week. I am sharing my Baked Zucchini Fries and they are so good! This one is a definate FAVORITE in our house. Holly has great recipes, just love her to death! It is so funny that you posted this today! I saw it on Life as a Lofthouse a while back and I plan on making it for dinner today. I have a feeling we are going to really like it! Bet those were good Tina! I happened to have posted a Cornbread Salad today so thought I would link in and share. Have a beautiful Sunday!! Yummy. These sound delicious and certainly worth making. Looks like a great recipe, Tina! And I thought it was so cool to show the brown sugar in a pitcher that said Home SWEET Home! Whether that was planned or a coincident, I LOVED it! It's always a treat to read your posts. Thank you so much for your efforts in making Mommy's Kitchen worth the visit! I am like Megan...saw this over at Holly's blog and thought it would be great for a dish on a hot summer night! Yours looks delicious and I have never said thank you for hosting the linky on Sundays...you take a lot of time for us. Mary thank you for linking up. Love seeing your recipes. @deebeefromnc that is actually part of a set to my gooseberry patch measuring cup set. They are my absolute favorite measuring cups. K the wraps were excellent. I could eat the sticky fingers all by themselves. We love Wingers Sauce and have been making it ourselves for a while now :) We like to eat our sticky chicken on a salad, but this week I think we'll put these wraps on the menu. Yum! Thank you so much for hosting. Those wraps look divine! I have made the sticky fingers, but those wraps. Oh my! They look perfect. Thanks for the post. I love chicken stripes with mayonnaise and catchup.. Love it so much..
Aubrey that sounds good adding the Sticky Fingers to a salad. I will remember that the next time I make them. My family and I would love those wraps! Thanks for sharing. I added my easy Mini Pecan Pie Muffins to the Potluck. Thanks for hosting! Stop by my Melt in Your Mouth Monday Blog Hop and add a recipe! Hi! This looks like a fabulous recipe. I shared it on my Must Try Tuesday post today. This looks so good. I am going to put it on my meal plan next week. I was worried about it being too spicy for my kids so am glad to hear you say that it isn't. My husband found this site and we have already had these twice in one week. This looks very yummy, and I am very excited to try it. Is there a particular type of frozen chicken strip that you recommend using for these? The ones that you used look really good, and I haven't had great luck with frozen chicken. Yes I only use the pilgrims chicken breast strips. I get them at Walmart in the freezer section and they are $6.98 a bag. Very crispy and really good. wow...looks great...bet the sauce is good on wing dings too! must give that a try for the big game! My kids are thanking you in advance for giving me this recipe! :) So tasty looking, can't wait to try them! I cant wait to try this, it sounds yummy and I know my hubby will like cause he likes hot things!! !